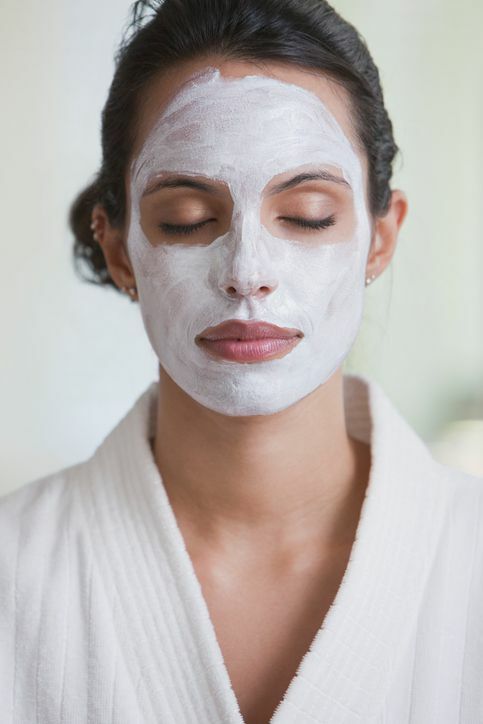 If you have oily skin, using a face mask can help keep your pores clean, make your pores look smaller, and draw out oil, dirt, and bacteria from your skin that can cause breakouts. You should use a face mask one to two times a week for best results. We feel a face mask is a splurge-worthy skin care product because you only use it a few times a month, thus ensuring the product lasts longer than, say your facial cleanser. Plus, most masks for oily skin can be used specifically as a spot treatment making them last much, much longer than other types of facial masks. Try one of the following facial masks for oily skin and watch your skin improve over time. Murad's Clarifying Mask gets top reviews on its ability to zap zits fast! The Kaolin Clay mask will help reduce the shine your oily skin gets. It uses acne-fighting sulfur as its main zit-zapping ingredient, plus zinc to reduce the swelling from your acne. Use twice a week for clear, healthy skin and pores, or use specifically as a spot treatment on your pimples, even leave on the pimple overnight for best results. Boscia's Luminizing Black Mask is a jet-black mineral rich mask that peels off and leaves your skin looking refreshed. It's made with quality clay ingredients that pull out impurities like dirt and oil. In addition, this mask will reduce oil production, deep clean pores and even help fight off the signs of skin aging. Those looking for paraben and phthalate-free products will be glad to know this mask is without both of those ingredients. It's suggested to be used 1-2 times a week and left on for 15-20 minutes each time. If you have 15 minutes to pamper yourself, your skin will love the results it gets from Bliss' Steep Clean Facial Mask. To activate this product, you need to mix two separate products together and apply to your clean face. Your skin will be treated to an exfoliation, pore cleansing and skin brightening all in one product. While this mask isn't specifically meant for oily skin, this product will dramatically clear up clogged pores or blackheads for you. Just like our first mask on the list, Dermadoctor's Ain't Misbehavin' mask is a sulfur-based mask that will clear up your skin in no time flat. This mask also contains Willow Phytosphingosine which is an ingredient that soothes and balances stressed skin. It's suggested to work up to using this product three times a week or as often as your skin can tolerate using it. Korres Cinnamon & Natural Clay Deep Cleansing Mask is a perfect choice for those with oily skin. It's a clay-based mask that will soak up all of the excess oil on your skin, thus helping to prevent further breakouts. You'll love the cooling effect this mask gives to your skin. You only need to use it once a week for best results. Burt's Bees Healthy Treatment Pore Refining Mask is another clay mask that uses French green clay mixed with dried herbs and flowers to treat skin. You'll notice your skin pore size dramatically reduced when you use this mask, plus, the blemishes you have already will quickly dry up. Keep in mind that this mask is a powder that needs to be mixed with water before application. Maybe not the most convenient type of mask, but you'll get so much more product for the money by mixing it up yourself. Suggested use is 1 to 2 times a week. Think of Peter Thomas Roth's Sulfur Cooling Masque as medicine for your acne-prone skin. The mask will exfoliate your skin, minimize oil production, and blast away those irritating blemishes. It uses a strong 10% sulfur to treat the acne and eucalyptus oil to prevent new acne from forming. Add in some skin-soothing aloe and this mask is a top-notch mask for oily skin. Suggested use is once a week, or again, as a spot treatment which we suggest even leaving on overnight in one small spot. Kiss My Face Potent and Pure Pore Shrinking Deep Pore Cleansing Mask is a natural skin care mask that mixes clay, which we by now know clears out pores, blasts acne and eliminates dead skin cells, with Tea Tree Oil, a natural antiseptic found in many acne products. You'll also get some inflammation relief with the Lemon Grass Oil in the product. Again using this product once or twice a week is ideal for the best results. Sometimes using a mask for oily skin can leave your skin feeling completely parched and dry. If you don't like that feeling, you will want to try Laura Mercier's Deep Cleansing Mask. It is a clay-based mask which deep cleans your pores and skin and soaks up the excess oil your skin produces, but it also contains skin-hydrating moisturizers and emollients to help your skin stay balanced and hydrated. Ole Henriksen's Firm Action Mask uses fine clays and herbs to provide an instant lift to your skin. The mask is formulated for use for all skin types and leaves your skin feeling smooth. Suggested use is two to three times a week after cleansing, and you'll have to make time because it needs to stay on for 10 minutes before you rinse it off. Clinique Acne Solutions Oil-Control Cleansing Mask is a long time favorite mask for many people that works great and doesn't leave your skin feeling dried out at all. Once again it is a clay-based mask that draws out impurities from your pores, reduces pore size, and blasts away acne you have plus acne that's forming. You only need to leave it on your skin for 5 minutes before rinsing off in order to see results. Ahava Purifying Mud Mask mixes mud with Dead Sea minerals to truly give your skin a detoxifying treat. While many of the masks on this list take from 5-30 minutes to work, you'll get a deep down purifying treatment in only 2 minutes with Ahava's Purifying Mud Mask. That makes this mask perfect for anytime use, even when you are rushed. Use once to twice a week for best results.